The global exchange-traded funds (ETF) industry nudged lower in size over the third quarter of 2018 despite a strong inflow of assets around the world due to currency headwinds from a strengthening U.S. dollar over the period. As a result, total industry assets fell from a little over $5 trillion at the end of Q2 2018 to $4.94 trillion now. However, the U.S. ETF industry returned to a strong growth trajectory after a lukewarm performance over the first half of the year, as upbeat economic conditions drove gains across asset classes. Notably, there has been a discernible trend in the market share of the five largest ETF providers in the U.S. (BlackRock, Vanguard, State Street, Invesco and Charles Schwab) over recent quarters. While these players account for 90% of the total ETF market in the U.S., industry leader BlackRock has seen a sizable reduction in its market share for two consecutive quarters while Vanguard, Invesco and Charles Schwab steadily improved theirs. State Street has also steadily lost market share over recent years due to its focus on institutional clients. 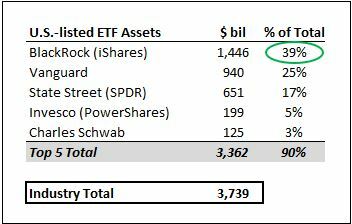 With a share of nearly 40% of the U.S. ETF industry, and more than 35% of the global ETF market, BlackRock remains the undisputed leader in the industry. However, the asset management giant has not been able to keep smaller competitors at bay, as evidenced from its loss of market share amid the ongoing ETF price war. As ETFs now form the largest chunk of BlackRock’s revenues, a steady decline in market share could have a material impact on the company’s valuation. Details about the impact of changes in ETF assets on BlackRock’s valuation can be seen using our interactive dashboard on BlackRock’s fundamental value. ETFs have seen impressive growth over the last decade, thanks to the convenience and transparency they provide investors, in addition to the relatively low fees. Over recent years, the intensifying competition among ETF providers has also triggered a price war among incumbents – making ETFs an even more attractive investment option for retail investors. The table below has been compiled from data gathered by ETF.com and captures the changes in U.S. ETF assets for the five largest ETF providers in the country over the last five quarters. As seen here, the total size of the U.S. ETF industry has increased by almost 19% over the last 12 months. While Invesco’s 55% jump in assets came largely thanks to its acquisition of $39 billion in ETF assets from Guggenheim Investments, Schwab’s growth has been primarily organic and can be attributed in large part to its ability to cross-sell ETFs to its brokerage customers as well as its large robo-advisory platform. Meanwhile, Vanguard continues to impress with its above-average ETF growth from its extremely low-cost ETF lineup. As we detailed above, BlackRock has reported lower-than-average growth in ETF assets for two consecutive quarters now. In fact, its growth in the last 12 months trailed State Street despite the fact that the latter does not have a major presence in the rapidly growing retail ETF market. The slowing growth resulted in BlackRock’s market share shrinking from around 39.5% over the four-quarter period from Q2 2017 – Q1 2018, to 38.7% now. While a reduction over two quarters is hardly a major cause for concern – especially given the sheer size of the company’s asset base – the fact that BlackRock’s market share has remained steady, while Vanguard managed to improve its market share steadily, highlights the latter’s success in attracting more cash from investors. What remains to be seen is if BlackRock is able to leverage its strength in the industry to reverse the declining trend over the coming quarters. If the trend continues, then the lower growth in ETF assets – coupled with the increasing pressure on ETF fees across the industry – could drag down BlackRock’s results substantially.